The Disneyland vloggers do such a horrible job representing and educating the fan community- it's all surface level fluff, regurgitations of the same stories over and over, and false assumptions. The Disney "news" channels that lurk the forums and quote our rumors and assumptions, or read articles written by Micechat, Mouseplanet, etc verbatim to "report" the news are ridiculous. I've seen many rumors purported as "fact", or verifiably false bits of "history" cited elsewhere online because a vlogger made an assumption about something in a video, and their fans latched onto it as gospel fact. Or the Disney "historians" that read chapters from Jason Surrell's books word for word in a "history" video over a montage of other people's footage. I had a brief dialogue with one once- I asked where he cites his sources/gains information- whether he's able to go directly to the sources and help gain new information, or if he's relying on other people's insight and interviews. He said he cites himself- since he's read dozens of Disneyland books. I was blown away. I'd love to see one that actually approaches Disneyland as a serious art form/business marvel- analyzes crowd flow, attraction/park design, even the pricing from both a business and fan perspective to provide insight into why Disneyland is the cultural phenomenon it is. A channel that is able to talk about the history of each attraction/location- provide insight into the changes that have been made and why they're good/bad. One that analyzes the people that managed and built the park we know today- their creative drive, insight, and influences. Apologies for the rant. This is a topic that makes me frustrated- since I hate that the first thing people see when they search "Disneyland" on Youtube is 10 different reviews of the pink dusted churro, and 10 different "Disney secrets they don't want you to know" videos. It cheapens what Disneyland is in the public eye, and hurts the fanbase that want to view and discuss Disneyland as something a bit more meaningful in American culture. I am sorry that you feel that way about many vlogging channels out there. I am sure that there are some out there that focuses and celebrates the history of Disneyland and its legacy. My friends and I have a channel as well called Disney Lost Boys and Girls. The name of course was inspired by Disney's timeless classic Peter Pan since that was one of Walt's personal favorites and it ties in to our goal. The goal for our channel is to celebrate Disneyland, positivity, embracing the inner child and friendship. If you like, feel free to check it out. Also on the 12th, we will be teasing an upcoming project for our channel. Really! I thought it was inspired by Disney's timeless classic Jungle 2 Jungle. Disney construction speculation can be a pretty big nuisance. One bit of Youtuber speculation going around is that MK's gonna get a Primeval World diorama because they're doing construction on the railroad where one could possibly go. I had to correct them that it was just rerouting the ponds as part of the Tron construction. Good looking vlog! Lots of positive energy. Perhaps I'm a cynic, but I'm not sure I can get behind the loud narration while riding Small World on a boat with other guests trying to enjoy the ride. I loved the thoughts and obvious enjoyment the ride was giving, but I always worry that it's someone else's first time experiencing something when I'm on a ride, and try to not impact their experience on an attraction. One bit of Youtuber speculation going around is that MK's gonna get a Primeval World diorama because they're doing construction on the railroad where one could possibly go. I had to correct them that it was just rerouting the ponds as part of the Tron construction. After the whole Matterhorn Queue Planters = Monorail 90 Degree Turn For Fantasyland Expansion thing, I realized many of these folks are on an entirely different level and it's best to just let them roll with it. I have vowed to not try and correct them or comment on their YouTube channels, and instead offer only encouragement and happy vibes. I've even decided that if I'm ever seated behind them in a Small World boat or Millenium Falcon cockpit while they obnoxiously blabber into their iPhone, I am not going to be upset. I will calmly move myself into their frame and look really, really happy. Look for me on their YouTube channels! Like! Subscribe! Patreon! I like people to know. Better to be told too early than to realize too late. You're better than I am- I'd loudly tell them to shut up in a way that tests the limit of what audio editing can do to make the video family friendly again. I became disillusioned with vloggers when one of them used a reddit post of mine as the topic of a video- and quoted comments that were made by others in my post verbatim, without giving any kind of credit to the people who originally said what he was saying. When I inquired about it, the his fan community jumped on me that "he would never plagiarize", and that's when I realized I'm not the target demographic for these things- since I'm not 10 years old. Most Disney Vlog channels are made for the same audience who watch Spider-Man and Elsa videos, Slime, Jake and Logan Paul, Some Jerk with a Camera, Fortnite kill compilations, etc are all made of an audience of 5-12 year olds as that audience has the most free time. There was that one train wreck of a vlog with the weird guy who went in The Haunted Mansion alone over and over again. I take that back. You would actually want to look at a train wreck. There was that one train wreck of a vlog with the weird guy who went in The Haunted Mansion alone over and over again. Sounds like me at the Parks. If he used the word "weird" in every sentence, then that was Justin Scarred. I actually think he's a 'Weird' Pokemon escaped from the Nintendo Universe. Nothing will ever beat the lady who thought the Carousel Inn Rooms were going to be converted so cars could park inside them. From Touring Plans. 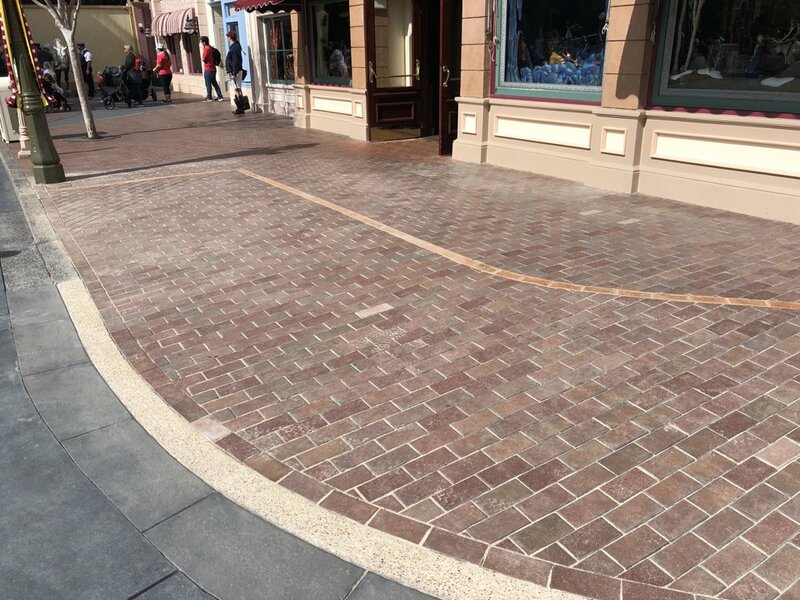 Some curbs removed from Main Street. The girl in front of me on the DLRR who once told her friend that they “got rid of Haunted Mansion for Gaurdians of the Galaxy” has overstayed her welcome. 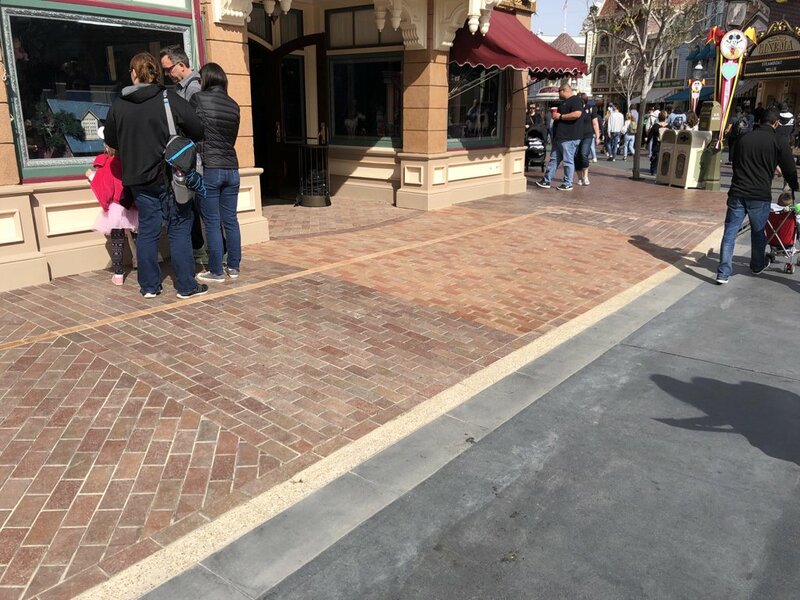 That was my favorite curb in the park... now the brick color doesn’t even match anymore... this is the final straw, the magic is officially gone. She was just anticipating Baby Groot’s House of Fun. Seriously guys, does everything have to be a sloppy patch job? Are you serious or just being sarcastic? Yellow indicates the beginning of a slope, so be careful. Green indicates "Welcome to our store". The out-of-place brick border is just there to indicate where you can lay down your blankets at noon for the evening parade.